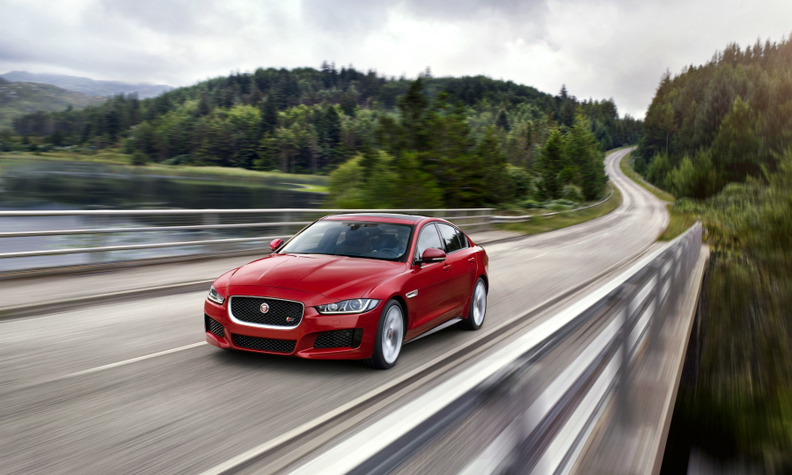 Demand for Jaguar's XE sedan helped to boost Tata Motors' profit. NEW DELHI/MUMBAI -- Tata Motors swung to a quarterly profit on the back of surging sales at its Jaguar brand, as exiled group Chairman Cyrus Mistry strives to remain at the helm of Tata Group's largest company by revenue. Net income was 8.28 billion rupees ($123 million) in the three months through September, compared with a loss of 17.6 billion rupees a year earlier, Tata said in a statement Monday. The Jaguar Land Rover unit posted a profit of 244 million pounds ($305 million). Jaguar's sales surged 84 percent in the quarter on demand for the brand's XE sedan and F-Pace SUV. The results come as Jaguar previewed its first full-electric vehicle today at the Los Angeles auto show. The I-Pace concept presents a sporty midsize SUV that is expected to go into production in late 2018 as a rival to EVs planned by German competitors Audi and Mercedes-Benz. Even with the profit posted at the Jaguar Land Rover unit, which accounts for 86 percent of the automaker's operating income, investors may focus more on the boardroom power struggle that has engulfed its parent for the future of the automaker. The automaker has recently been caught in the turbulence at group holding company Tata Sons, where Mistry was abruptly removed last month as chairman less than four years after succeeding Ratan Tata. Mistry remains chairman of Tata Motors. In relation connection with the feud between Mistry and the parent group, the independent directors at Tata Motors' board said in a statement that they support and have full confidence in the management of the company and its subsidiaries. Mistry had said he was wrongfully terminated as chairman of the parent company and alleged that constant interference from his predecessor undermined his ability to fix problems at the group, according to a copy of a letter to the board of Tata Sons seen by Bloomberg. Tata Sons, which owns about 27 percent of Tata Motors, has sought an extraordinary meeting of shareholders of the automaker to consider removing Mistry and Nusli Wadia as directors.